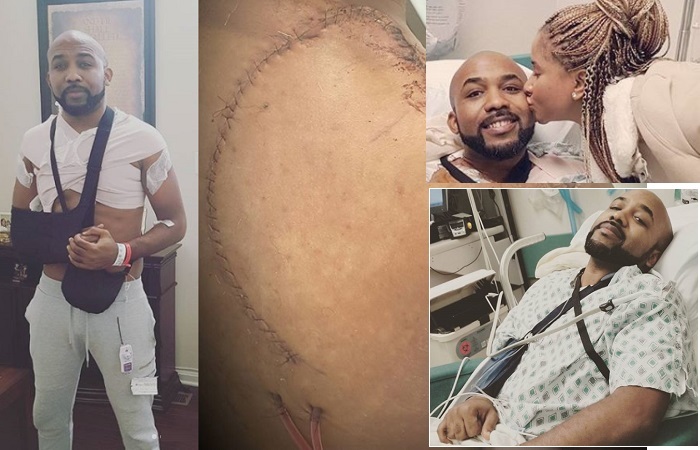 Banky W is the guy in the Coca-Cola elevator ad, he's been off the social media for a while, but when he returned, he shared pics of his shoulder skin cancer operation that left his fans worried. 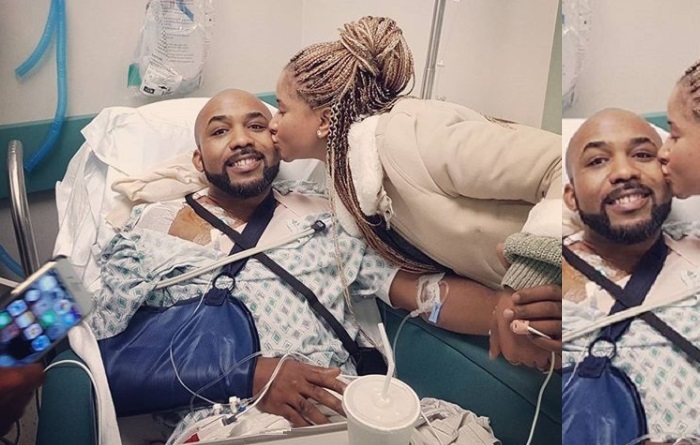 The Nigerian singer, actor and rapper Bankole Wellington aka Banky W while sharing the pics of his operation told his fans not to feel bad, or send him texts with any worries, "God has done it, just thank him for me.," He noted. "Scars are a sign that you had been hurt, A sign that you had been healed.."
"For those who've been wondering why I've been away so long..I had my 3rd surgery on a rare strain of skin cancer tumours in my shoulder last month. The first 2 times were over 10 yrs ago, then it recently resurfaced. But this isn't a sad story as much as it is a reminder, and a testimony." "A reminder that you should never take life for granted. You only get 1 shot. Some people went to sleep and never woke up. Many others have lost the battle to cancer and other illnesses. Many are still fighting. U never know when your time will be up so don't waste another minute. It's also a testimony about the goodness of God. I think I had to go through this again to remember how merciful God is to me; Lord knows I don't deserve it but He saves me time and again anyway." Banky thanked his beautiful nurse, Susu, they will exchanged marriage vows on December 15, 2017. "The past few weeks of recovery have been tough, but beautiful. I'm finally back on my feet, feeling stronger and ready to get back to life. I'm especially thankful to my Nurse Susu for loving me and being by my side every step of the way - I don't deserve you, my parents and siblings, in-laws and close friends for the love, support and prayers, my Pastors for constantly praying with and for me. And of course to Dr Wodajo, Dr Miralli and their teams - who God used to operate on me successfully." "The pain will eventually go away but the scar won't - and I'm glad because it's a reminder to me of what God has done, and evidence to you of what He CAN do. I'm not stronger or better than anyone. I'm just a living testimony that no matter what u face, you can survive and thrive, by God's grace."